Explore news and press releases below. Read about us in the news and learn about how our projects and community efforts are making a difference across the country. Members of the Pennsylvania Energy Infrastructure Alliance today joined legislators and business leaders from around the state to spotlight the safe, responsible development of the state’s pipeline network and related infrastructure and the economic value these projects bring to communities across the commonwealth. Read and download these helpful fact sheets that detail our projects, integrity programs, construction methods and more. Browse and view videos that give a closer look at Energy Transfer. Check out even more videos at our YouTube channel. 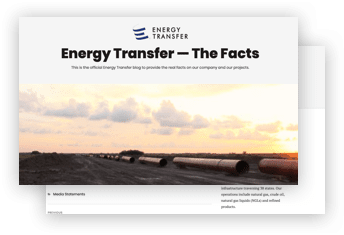 Check out the official Energy Transfer blog to see real facts on our company and our projects.